Wednesday 9 July 2014, by Julia Duchemin. In last April, a great adventure took place, aiming at realising meaningful outreach work and to raise awareness among audiences about art by transcending the social, psychological and language barriers. 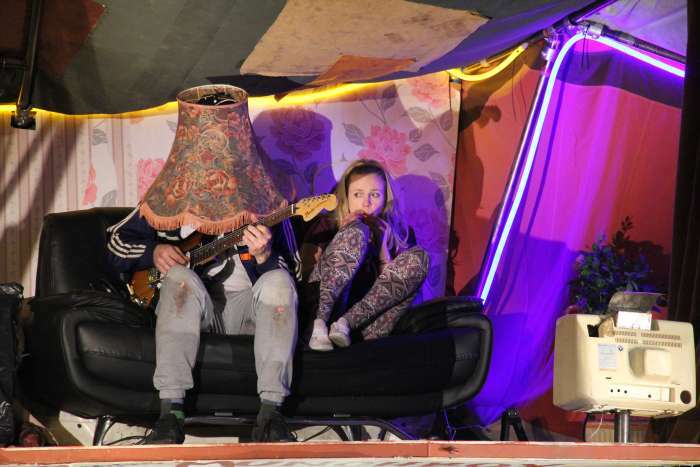 Company Ramshacklicious came in residency at Atelier 231, as part of the ZEPA 2 project, to work on their new show Grime. 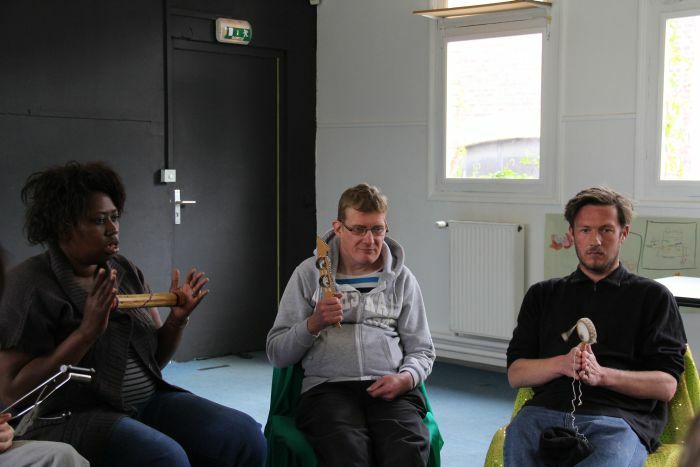 During this month-long residency, video workshops have been organised in collaboration with the Pôle Image Haute-Normandie with a group of patients suffering from mental illnesses from Lucien Bonnafé day hospital of the Rouvray hospital centre. 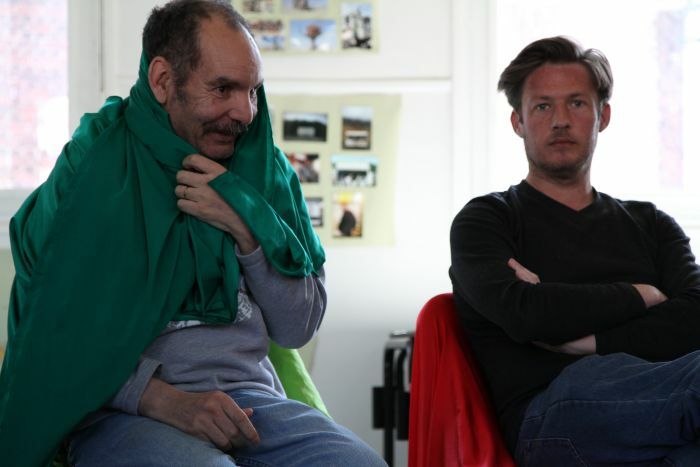 The workshops were led by Mickaël Leclère, an independent film director, and were part of a larger initiative called Passeurs d’Images. 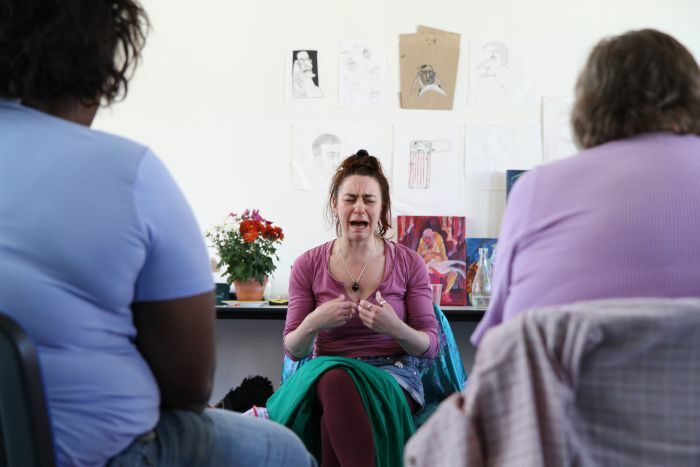 Simultaneously, Holly, a performer/drama-therapist from the company, conducted a series of artistic workshops (theatre, writing, drawing, singing…) with a different group of patients from the same hospital, exploring what it means to live with a mental illness. The objective of this film education initiative was to realise a documentary, “Meat is burger”, about the daily life of a company in its creative process. A group of 7 patients followed basic classes on film making and then had 48 hours of video workshops to actually make this film. The group brainstormed on how they should lead the construction of the content of the movie (footage and interviews), which helped develop their collective imagination. 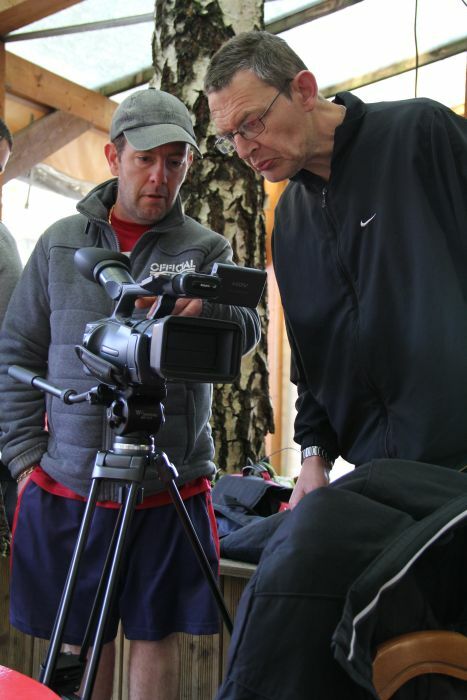 Through the different techniques – sound capture, framing, light, editing and interviews – each patient found his or her own place and expressed creativity. 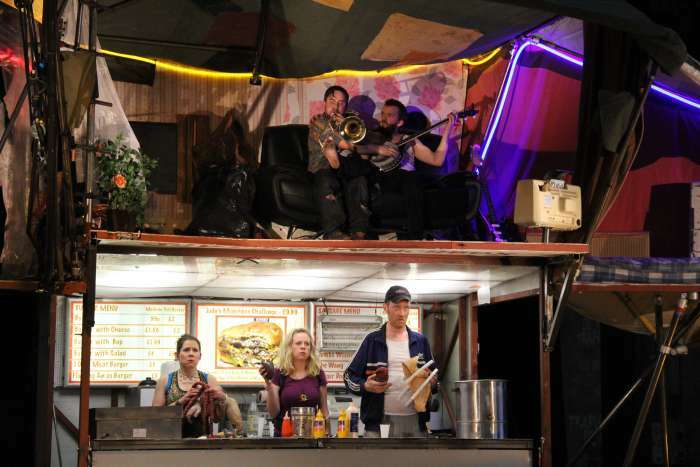 By interviewing the artists from Ramshacklicious, they learned about all the different trades involved in the making of the show (director, set designer, costume designer, performers, writer, sound designer…) and they learned about the people composing the company. 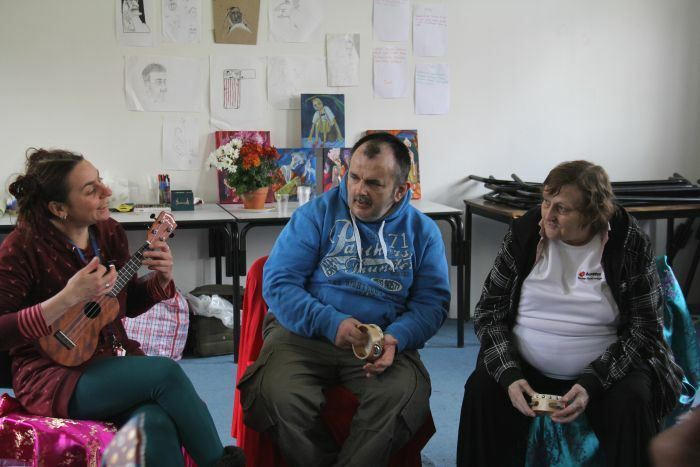 The group also recorded the artistic workshop led by Holly with the other group of patients, which allowed for a beautiful exchange and a new take on other persons. 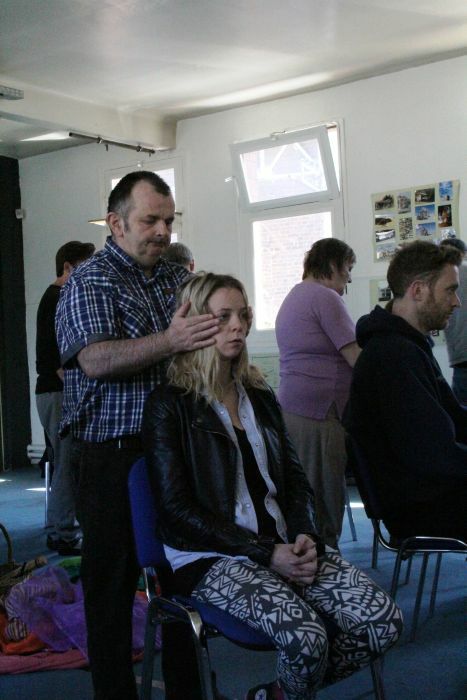 These workshops helped developing a team spirit and a sense of support from one another. Today, the patients are more comfortable using the equipment and they were able to teach their own knowledge and share their experience with the other participants. They were able to express their artistic sensitivity through motion capture, framing, editing. The choices of each participant were always highlighted. The workshops were always led in a friendly, serene and benevolent way. This project came to be thanks to the ARS (Agence Régional de Santé)’s and the DRAC (Direction Régional des Affaires Culturelles) of Haute-normandie’s financial partners as part of a call for projects around the arts and the health care system, from the “the Arts at the hospital” initiative. 1/ Can you introduce yourself and tell us a few words about your professional background? 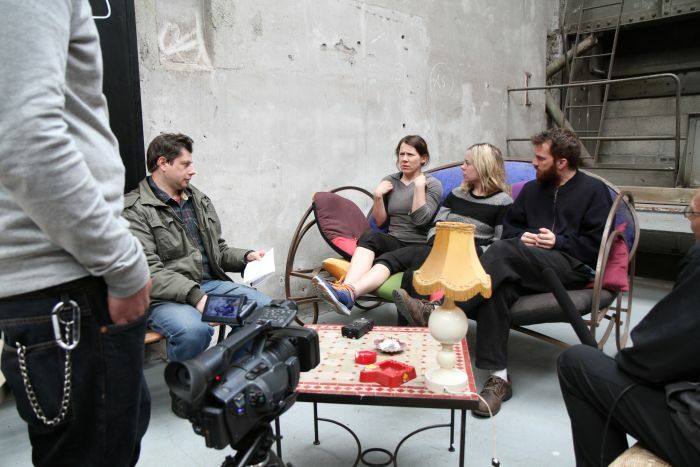 I followed cinema studies and I have been an independent film director for 5 years. I have specialised in making music videos for independent labels. I chose to work with people that are in the fringe of the musical industry. It’s my motto: “to work with those that are not supervised by ‘professional’ structures, with those who are independent and with all the followers of the DIY (Do It Yourself)”. In this context, I had the opportunity to join the “Passeur d’images” programme via the Pôle Image de Haute-Normandie. 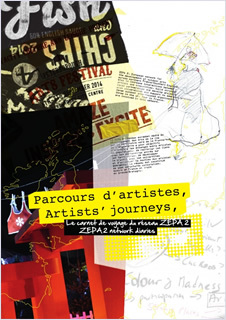 2 / Could you tell us a bit more about the « Passeurs d’images » programme? 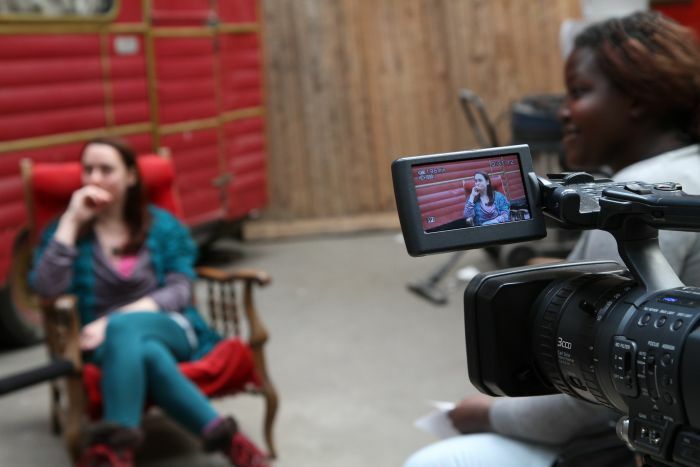 Passeurs d’images is a film education initiative which organises extracurricular projects, aimed primarily at young people, who don’t have easy access to films and other audiovisual events and activities. This programme is supported by the government – the culture and communication department – and by the National Centre for Cinematography, and is locally coordinated by the Pôle Image Haute-Normandie. 3/Could you explain how the video workshops with the patients were structured? The workshops were organised in three main phases. The first step was about manipulating the equipment and discovering the basic rules of video making. We showed examples as we explained so as to make it as clear as possible. My goal on this first session was to demystify the audio-video equipment. For instance, the patients started using the cameras from day one so that they could be familiar with it as soon as possible. The second step was making the film. The main obstacle for the patients was to get their marks on the spaces and be at ease with the persons they had to interview. Thanks to a previous collaboration between Atelier 231 and the hospital, in 2013, the patients already knew the different spaces. Regarding the interpersonal aspect, the patients were extremely benevolent between them. 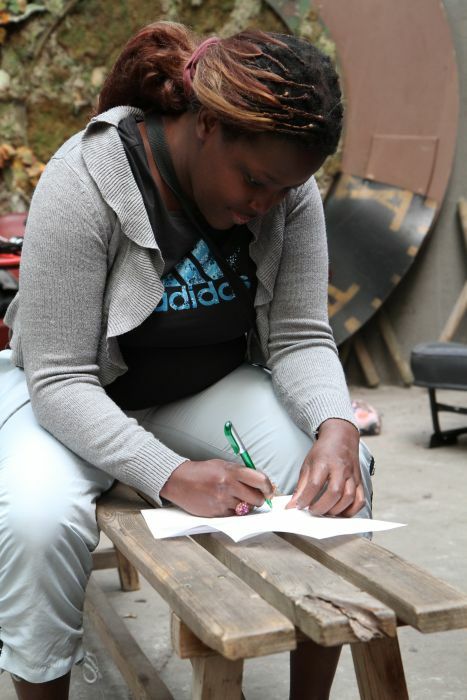 The group had a very positive impact, which allowed each of them to be at ease with people they didn’t know. The initiation workshops clearly played a major role too, because the way the patients framed their image was very “pro”. The idea was to give them more and more liberty to act on their own, without me systematically controlling the frame. The completion of these workshops was the shooting of the performance during the work-in-progress visit by the company, where the patient have been completely autonomous in their choice of frame. They had no instructions from me – I was filming from another camera to get a second angle. The third and last step was the editing of the footage and the search of the title for the documentary. For this, I came back for a month with an editing station at the hospital. The eight patients were there with me, in front of the mixing table, deciding together which direction the work would take. I wanted them to operate the computer themselves, but they had trouble using the mouse, so I had to give up on this idea. So we decided together that I would take care of the technical part and that I would execute what they wanted me to do; in a way, I was their hands! I simply guided them sometimes when I was seeing that something was not working out. 4/ Now that these three months in the patient’s company are over, do you have a particularly fond memory of the project? I don’t really have any precise moment in mind, more of a precise person. I should say that during the workshops, we tend to work on a case by case basis. As much as the workshops can be very beneficent to active participants, they can also be hard on shy persons that tend to stay in the background. Which was the case with Florent, who I already knew from last year’s movie making project on company Babylone, which was staying at Atelier 231 as well. Florent is an extremely shy kind of person for whom it is very difficult to establish eye contact with other people. He would rather look at his shoes, which bothered me a lot because I could see that he was interested in the workshop but that because of his shyness, he had trouble fitting in. So we encouraged him to be the journalist of the group, we were saying “Go on, you can do it!” And we discovered a whole new person. And that is where the magic happens. It is so fulfilling to see I can bring something like this to the people that participate in my workshops. Today, despite his timidity, Florent still gives back a very positive vibe. It is a personal victory for me. Another great moment was the interview with Holly. It was very smooth. With the patients, some days are better than others. They are different when it’s sunny or when it rains. On rainy days, they are sadder. But during this interview, everybody was in a good mood, at ease, even with the questions. That is brilliant memory! Still in a serene and sharing atmosphere, seven other patients took part in a 12h series of artistic workshops. On the first days, each participant, with Chloé Lacheray - their educational therapist – and Holly, took the time to listen to each other, discuss and understand each other to define as a group how they wanted the workshops to go. Using different disciplines like theatre, singing, poetry, drawing, etc, the patients were able to speak up and free their bodies to express their inner thoughts and anguish. This artistic and intimate exploration allowed expressing what was each patient’s illness through items such as a flower pot, pieces of fabric, music instruments. These exercises were a break from the daily routine, as Cholé explains, “the exercises were an opportunity to break out, to have a better feeling of the body, to stimulate their imagination and to create a common imaginary world. I had rarely seen these patients opening up like they did”. 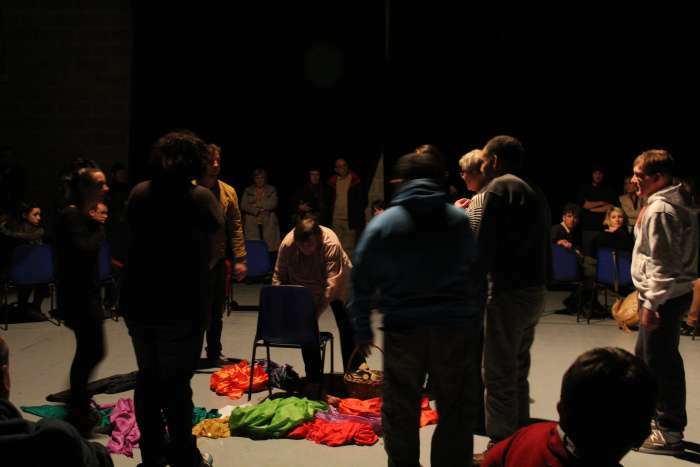 A public performance at the end of the workshops took place during the work in progress visite by the company, which allowed the patient to stand up to the audience’s look. 1/ Could you introduce yourself and tell us a few things about your background? I’m Holly Stoppit. I grew up on the road with a circus-theatre family, then trained with as many inspirational clown and improvisation teachers as I could and worked extensively as a clown / musician / director in circus, street theatre, cabaret, rural touring and schools. In 2010, my deep fascination in the transformational potential of creative process led me to studying for an MA in Dramatherapy. My dissertation research focused on the potential therapeutic benefits of clown skills training (Clown-o-therapy). I now mostly work as a clown teacher, clown consultant and clown therapist. 2/ Can you explain what you did during the workshops with the patients suffering from mental illness from the Lucien Bonnafé day hospital? What did you work on in particular? The workshops were designed to respond to the patients’ needs / desires / preferences, meaning that I took my lead from the group, providing ‘containers’ (or structures) for the group to find ways to creatively express themselves. The group comprised of 7 patients from the hospital, their educatoriste, Chloe and either Sam or Julie as Translator. The first couple of sessions were about us all getting to know each other and me finding out how the group best liked to work. We played games, danced, made up stories and songs, created artwork and did a bit of character work. 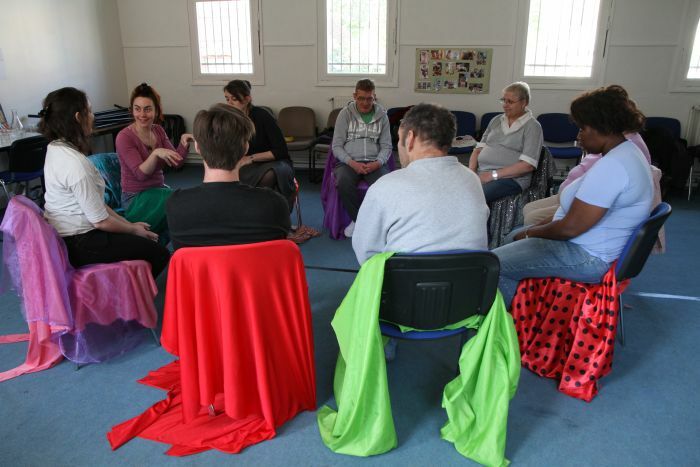 Each session was carefully paced, we began with a group check-in, where everyone had space to express how they were today- for this we used movement, art-work, music, fabric. Next we did a playful physical / vocal warm up. Then we did a few ensemble exercises, to equip the group with the devising skills they’d be using to create a performance. Then there was a period of devising before coming back together as a group to reflect on the session, sometimes verbally, sometimes using group art-work. We did a quick check-in to see how everybody is now before closing the session with a circle game or two. The group had a chance to learn about the creation process of Ramshacklicious’ “Grime”, by trying out some of the exercises we’d used in the R&D, observing the company in rehearsal / the tech crew in production and having group discussions about the themes and issues contained in the show. The theme of mental illness came up naturally, from the group’s first impressions of the R&D character sketches by Tomasin Cuthbert. I asked what they thought about the characters, the group said they looked sad, isolated and frightened. I agreed. Some spontaneously added that they also feel sad, isolated and frightened. I asked the group what they would think to making a performance to show the company what it’s like, living with mental illness and they enthusiastically took up the challenge. To create the piece, each of the seven group members performed a solo, where they spoke about their illness. I placed a chair somewhere in the space to represent their illness, they could describe what it looks like, sit in the chair and be it or stand behind the chair and speak as it. These solos provided the material for each of the group members to direct the rest of the group in a short physical ensemble piece. As director, each member had the power to ask for exactly what they wanted. 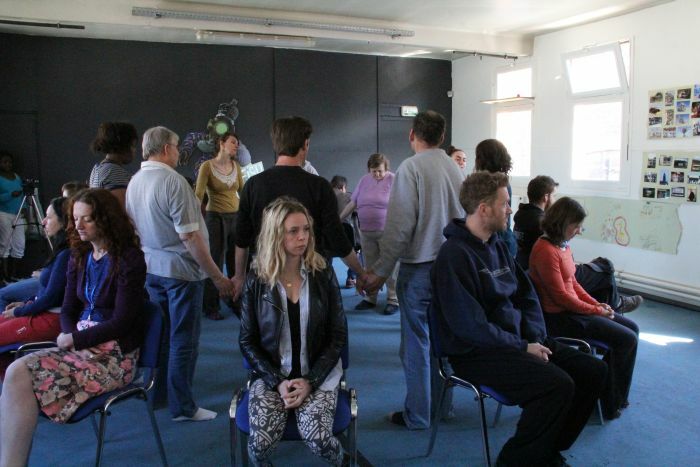 For the performance, the company were brought in and seated in a big circle, with chairs facing outward. 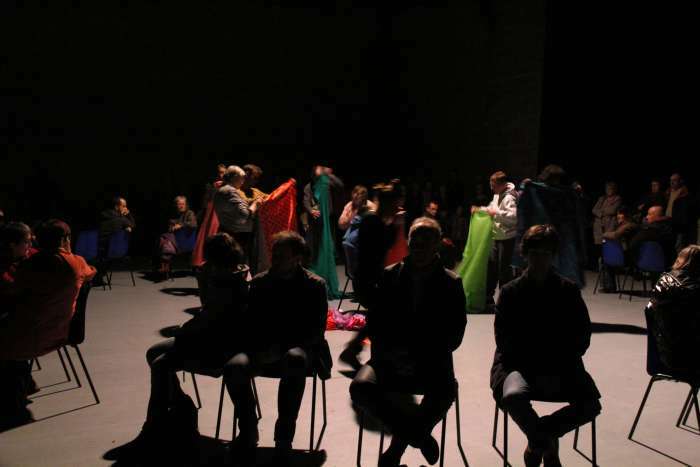 The performers weaved in and out of the chairs performing seven short ensemble pieces. ’The Nightmare’ was a loud and frightening piece, with percussion instruments and heavy breathing. In ’Depression,’ the performers stood inside the circle and beat their chests with their hands. In ’Stifled Scream’, the performers raged about, trying to physically stop a scream from escaping. In ’Shy" the group tried not to be seen behind pieces of fabric. In ’Anxiety’, the group knotted up the fabric and breathed shallow and fast, rushing about. In ’Voices’ the performers placed their hands over the ears of the audience members while one performer played a solitary drum around the perimeter. ’Sadness’ was a poem written and read by one performer, whilst the others walked slowly around with their hands on their hearts. 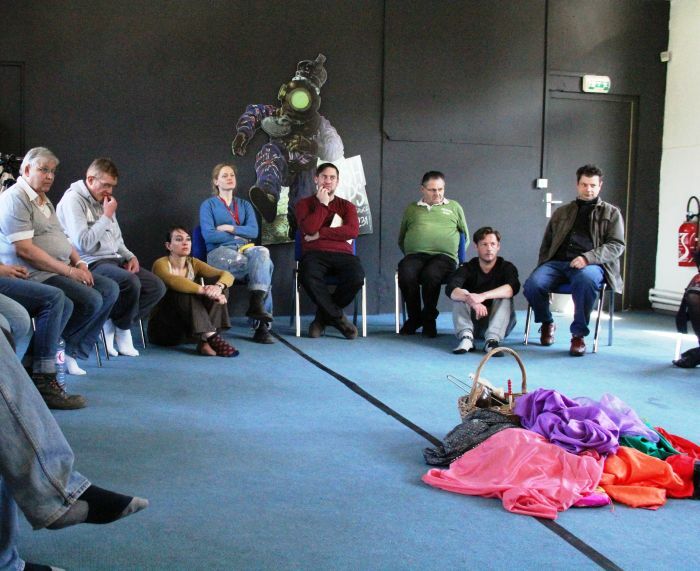 The company were genuinely moved and inspired by the performance and thanked the performers for sharing themselves. The group were so empowered by having created these pieces and then having their creativity witnessed by an audience, that they asked to perform their pieces alongside “Grime” for the public audience. In our final rehearsal, the group came up with a new ending. 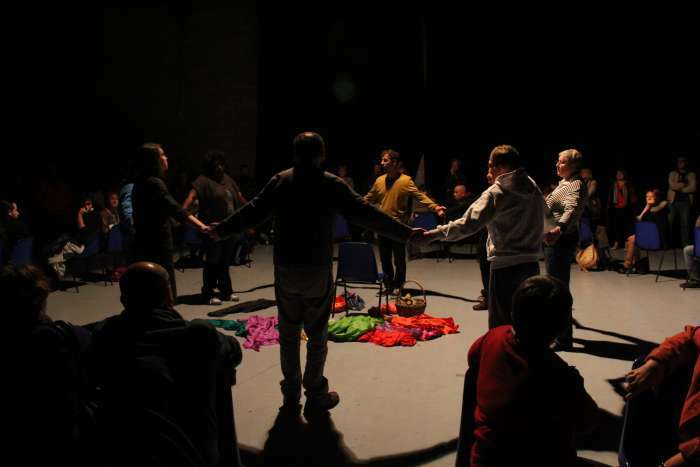 We stood in the centre of the circle, holding hands and each person took it in turns to say a sentence beginning with “Together….” The piece suddenly became a celebration of our group and our time together. 3/ What will you remember about this experience? Do you have a favorite memory? In the first session, we did a group improvisation where we imagined we were in a park, I asked “what happens next” someone offered “we pick flowers” so we all gathered wild flowers. “what happens next?” “We give the flowers to each other!” So we did. The following session started with a check-in circle. I’d brought in some real flowers for the group. I asked each of them “Which flower are you today and why?” Some of them were the wide-open sunshine seeking ones, others the tightly curled sleepy ones. At the end of the session, I brought the flowers back and everyone chose an open flower this time. The collective artwork from this day on always featured at least one bunch of flowers. I enjoyed seeing the group find their confidence to express themselves with music, movement, words and art. I loved being inside their imaginations with them. Here’s some of my favourite images from our sessions… A poorly giraffe with a ladder propped up against it so that the vet could reach it, a circus ring, a bathtub and a racecourse made of a loop of red fabric, frequent appearances from superman, sadness, joy and jealousy played on percussion instruments, sound-baths, the human car wash and everybody’s own secret garden. The group seemed absolutely delighted the day we did the “back-stage tour”. They met Tomasin the costume designer and got to see some of the revolting costumes she was working on. They met Emma the puppet maker and got to see some of the meaty puppets she was making. They met Pete the sound designer and listened to some of his meaty sound samples. Then they met Will the set designer and got to see his bread-roll launcher in action. The final round of applause. After our group piece, the audience clapped and clapped and clapped and I looked at the group and said- “what shall we do?” One patient said “lets walk around the circle.” And so we did a lap of honour, all holding hands and taking our applause. I am Felicity (Flick) Ferdinando. I am a Performer and Director. I have an eclectic training and have covered a lot of different genres of performance. I trained in Ballet and some Comtemporary dance from a very young age. I studied classical theatre with a Youth theatre for seven years that was affiliated with a repertory theatre, this is where I absorbed the discipline of theatre. I then went onto a circus school in Bristol called ‘Fool Time’, here I studied Le Jeu, Expressive Theatre and Physical Theatre. I specialised in aerial, mainly trapeze. I then moved into dynamic partner acrobatics. My interest beyond my training was to then bring all of these forms together to create work, work that used circus to tell narrative, narrative told through physical visual theatre using text born from the physical work. I created a company which toured work nationally and internationally for thirteen years. Company FZ. I was also the Head of Theatre and Artistic Advisor for the BAhons in Circus Arts at The National Centre for Circus Arts (formerly The Circus Space) in London for eight years. 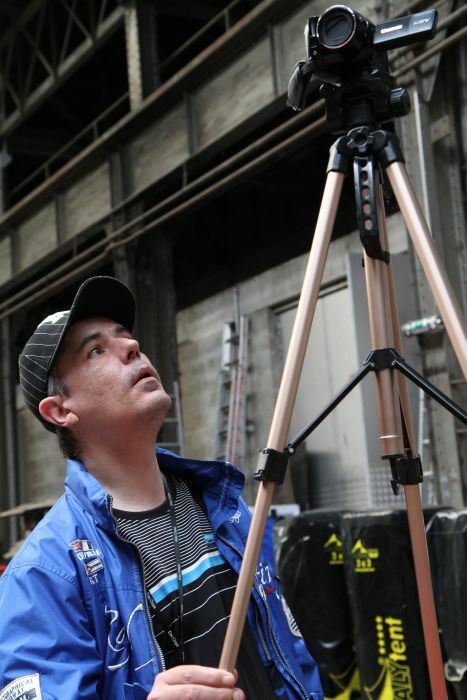 During this time I have also worked extensively in street arts as a practitioner and also as a freelance Director for theatre companies in devised theatre, outdoors and indoors. 2/ Can you tell us what your job on this new creation was? I was brought in to cast the show and then to work with the performers and technical team to create a piece of work and then to Direct the work. 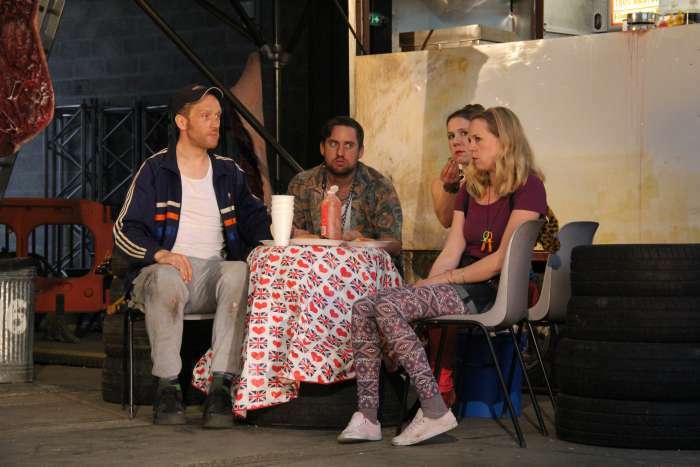 Some research and development had initially happened where the Artistic Director of the company could make some clear decisions from as a starting point for the devising of the actual piece. It was my responsibility to then develop the characters with the actors, guide the process of creating the narrative, liase with the technical crew on their needs and how their work would feed into the process and finally to direct the piece when all the material had been created and we felt the story had a good flow and sense. 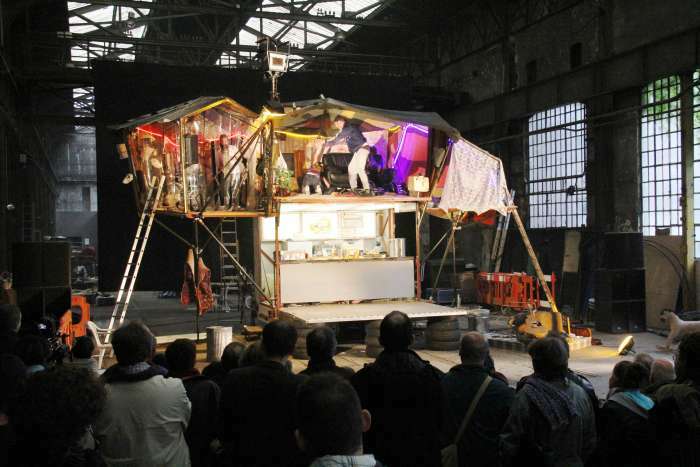 3/ Can you tell us what you have worked on, during your residency at Atelier 231? At Atelier 231 I spent the first week looking at the narrative with the characters in mind and finding the relationships between the characters, how they interacted with each other, their levels of play. Looking at the level of play throughout the piece, where it could become more grotesque in its nature. We played games and moved through exercises to do this and also to give the actors a common language with which to work from. We then began making some material that we knew would definitely be in the piece. We continued to look at the narrative of the whole piece and ran the whole piece with sketches of scenes to see if it was making sense. We went back to the narrative three times in full discussion to find the logic of the piece. Alongside this we continued to develop particular scenes that we knew would happen as we wanted to show some strong work as sections from the whole show to the audience, it was important for us to see how the audience would react to this kind of material, if the comedy would come through such a dark subject matter. On returning to the UK we could then take this work and continue knowing that we could push areas further or bringing them back, we could finish the piece knowing that we had a strong narrative that had been thoroughly investigated.